What we call the American Revolution became a revolution by virtue of the Patriots' victory in 1781. Until then, it was a rebellion—factions fighting each other with words and weapons. In this Theme we follow the American rebellion as it turned into outright war in 1775 and 1776. Sections 1-4 consider the civil war between Patriots and Loyalists in the north, south, and backcountry. Section 5 views the struggles of religious pacifist groups as they sought tolerance as conscientious objectors to war. Section 6 examines the debate over slavery at a time when white men, including slaveholders, were declaring that "all men are created equal." Sections 7-8 focus on the critical year of 1776 when many colonists abandoned hope for reconciliation with Britain and embraced the goal of independence. We examine two documents that exerted inestimable influence in achieving this transition in 1776—Common Sense by Thomas Paine, and the official statement of rebellion, the Declaration of Independence. 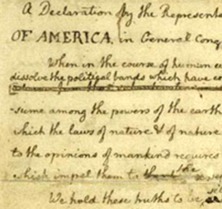 Block Image: Thomas Jefferson, manuscript draft of the Declaration of Independence, June 1776, p. 1 (detail). Courtesy of the Library of Congress, Manuscript Division.